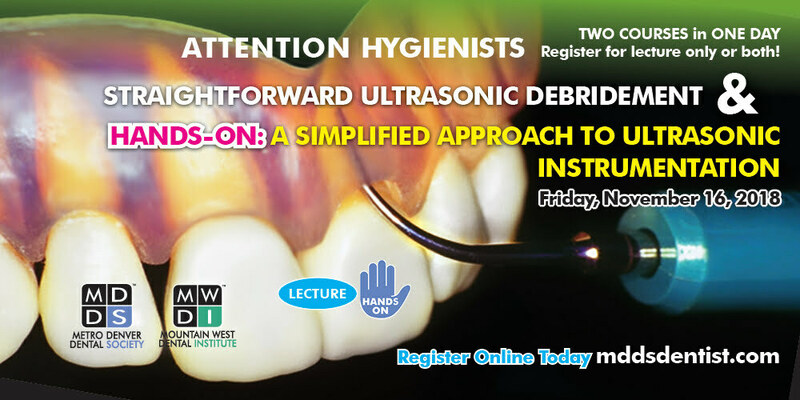 This course provides the fundamentals of ultrasonics that will enable clinicians to immediately incorporate ultrasonics in clinical practice for the purposes of complete periodontal debridement. It will begin with a discussion of the changes that have occurred in the treatment of periodontal disease and its impact on the use of power scalers and end with recommendations for appointment sequencing. Emphasis will be placed on differentiating between technologies and providing clinical recommendations, including patient medical/dental considerations; equipment set up; and insert sterilization/replacement guidelines. Detailed instructions will be presented on the rationale for the use of a variety of inserts; instrumentation techniques and sequencing. This hands-on workshop will begin with a discussion of the changes in the treatment of periodontal disease and its impact on the use of ultrasonics. Emphasis will be placed on detailing the fundamentals of ultrasonics (including differentiation between scaling equipment) with a focus on ultrasonic instrumentation for the purpose of gross ultrasonic debridement, definite debridement and de-plaquing. Patient cases will be utilized to prescribe instrument selection, sequencing and to assist in selecting the appropriate technology that will meet the individual needs of the patient. At the completion of this workshop, the participant will gain the confidence and skills necessary to immediately incorporate the use of power scalers into clinical practice. PLEASE NOTE: Participants must complete the Straightforward Ultrasonic Debridement lecture prior to attending this hands-on workshop. Ms. Cynthia Fong is a dental hygienist and a national and international speaker who presents continuing education courses and academic lectures on topics related to disease prevention and therapeutic oral care. She is a graduate of Union College and Columbia University. Previously she was a faculty member at the University of Medicine and Dentistry – New Jersey Dental School. Ms. Fong has been a member of and has held several leadership positions with the American Dental Hygienists’ Association and the American Dental Education Association of Dental Schools. Previously she served as a committee member of the American Dental Association National Board of Test Constructors in Dental Hygiene and as a Board of Director for the Commission on Dental Competency Assessment (formerly North East Regional Board of Dental Examiners). Ms. Fong has been recognized for her efforts and contributions to the profession as a recipient of national, state and local awards including the Warner-Lambert/ADHA Excellence in Dental Hygiene. Continental breakfast provided. Lunch provided for attendees taking both the lecture and hands-on courses.